I play the trumpet. Also the flugel horn and things like that. I do it quite a lot, and people have been paying me to do so since 2006, and a bit before too, though nothing to write home about then to be honest. Kelis, Sam Smith (the singer one, not the excellent value UK pub chain), Paul Epworth (Adele), John Paul Jones (Led Zeppelin), Sophie Ellis Bextor, The Cure, Paloma Faith, Jamie Cullum, Baaba Maal, Roni Size, Jarvis Cocker, Kojey Radical, Bugge Wesseltoft, Angelique Kidjo, Mulatu Astatke, Last Skeptik, Billy Bragg, Charlotte Church, Azekel, Eliza Doolittle, Eric Idle, Redlight, Jim Bob (Carter USM) and more, quite a few of whom I have also arranged music for. I have played in pits for touring and West End shows, though that's not really my thing, and toured for a year with a musical about Elvis. I was young, and needed the money. And I learned a lot about Elvis. 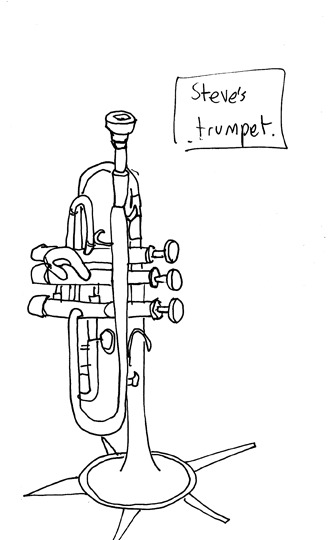 If you're interested, I mainly use a Monette trumpet because I am well fancy/good at eBay. I also have lots of associated bits and bobs like a herald trumpet and pocket trumpet and cornet which are mainly used in theatre and comedy work as no-one would take me seriously in the music world otherwise. OK, it's likely they don't anyway, but still. You can also hear it on our Sky Arts Christmas Special from 2015, especially on my arrangement of In the Bleak Midwinter. This side of my trumpet work has really grown over the years (and increasingly crosses over with my music production work), and I now have a lot of fun toys and techniques which I like to use to augment my sound. So whether you want classic trumpet noises or something a bit more unusual and contemporary, if you would like to hire me to do live trumpety things for you, let me know. As well as producing in my home studio, I also record myself playing trumpet, flugel horn or other things. I have done this for lots of people over many, and it works very well. I can generally turn around a recording very quickly (please check with me as it may take longer if I am touring a lot at the time), and deliver the files via Dropbox in low res MP3 for your approval, then tweak as appropriate and ultimately deliver in uncompressed WAV or the format of your choosing. Often people will want a specific part played, but then also a couple of takes of me trying out some improvised ideas over the whole track. This latter stuff often gets used a lot in the final track. I charge very reasonable rates, and have never had a client who wasn't satisfied, so if you would like me to add some tasty trumpet, flugel or trumpety electronics to your tracks, let me know. And lots more bits and bobs. I can, of course, come to your studio, as I have done for the likes of Sam Smith, but if you're on a budget, recording in my home studio works great. Photo by the always brilliant Idil Sukan. Taken on stage at the Hammersmith Apollo, December 2014. I have been a trumpet and improvisation tutor for Goldsmith's College and Brunel University, and have also run education projects with The Roundhouse, Royal Opera House, Nottingham Trent University and Hackney Empire. I have recently started giving masterclasses in trumpet, and featuring some of my electronic work. I try to bring a new approach to masterclasses by emphasising practical advice pitched at the level of the students, and offering them an unusual perspective on being a contemporary instrumentalist, including tonal and electronic augmentation, concept and presentation alongside conventional masterclass areas like improvisation, ensemble playing, technique etc. 'I just wanted to drop you a note to say how enjoyable the masterclass evening was tonight. Steve Pretty was fabulous with the students and it was wonderful to hear him play. If you would like me to run a masterclass at your school, college or university, please get in touch. In 2014 I was artist-in-residence at ACS Cobham International School. From 2012-2014 I ran a collaborative unauditioned band for the Oslo Mela Festival. I give private lessons from my home studio in Dalston, London, and can also give lessons via Skype. I like teaching but these days don't have a whole lot of time to do it, so regular lessons are a bit tricky, but if you don't mind them being infrequent or at irregular times, drop me a line using the buttons above.